I really enjoyed this book. It’s billed as a retelling of Jane Eyre, which is wholly inaccurate. 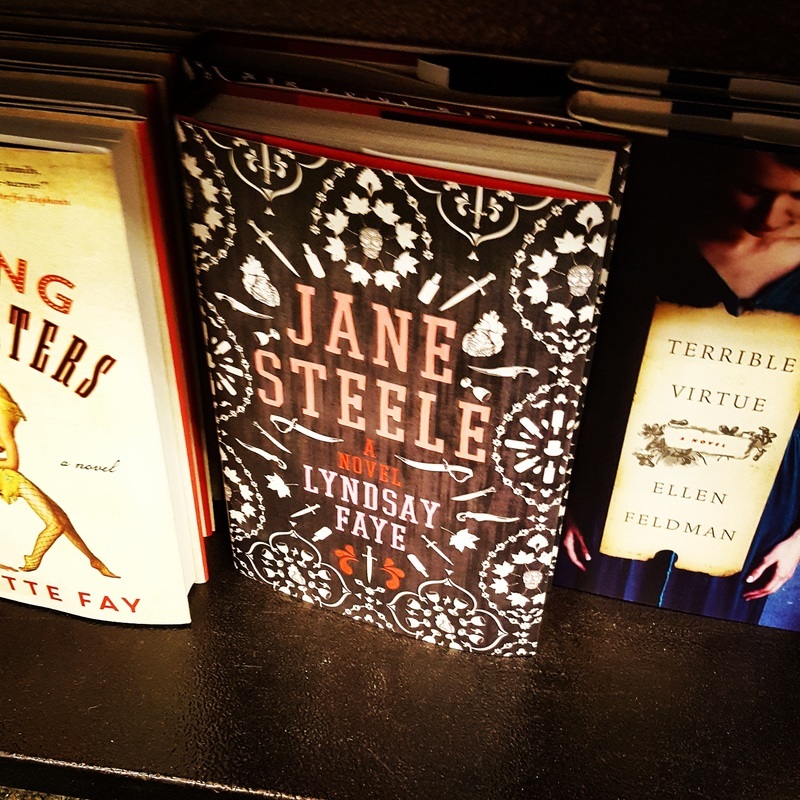 Jane Steele is very aware of Jane Eyre–in fact, it’s her favorite book. But Jane Steele’s lifedoes mirror her favorite heroine’s in some respects, but there are vital differences, the largest of these being our heroine is a murderer. It regretfully took me a bit of time to read this, but not for lack of wanting to read it. I didn’t have the time to sit down and devour this book in one go as I’d have liked to, but it is definitely the sort of book that lends itself to binge-reading. The tone is arch clever, and it recalls nineteenth-century novel language without being indecipherable to a more modern reader. While this isn’t a YA book, I think it is a book that recommends itself to readers who enjoy YA. I hesitate to say that, of course, because so often people think that the YA is somehow less of a genre than literary fiction meant to be consumed by adults, but with a heroine whose age is twenty-four, she exists in a sweet spot that brigdes the gap between YA novels and adult novels and also speaks to the young readers who, like myself, find themselves somewhere in between these two intended age groups. I would definitely read another novel by Faye like this–drawing cleverly on the classic novel we all know while adding new elements and crafting her own story that is fresh and engaging. I was really excited to learn about the Pink Ranger comic run several months ago. Like most kids born in the ’90s, I watched Mighty Morphin Power Rangers with a fervor bordering on reverence. Unfortunately, because I was a girl who didn’t (and who still doesn’t, really) like the color pink, I never fully appreciated Kimberly until several years ago, when I realized I hadn’t given her a chance just because she was the Pink Ranger. Which is, ultimately, a shame, because she’s pretty great and badass in a time when there weren’t a whole lot of kickass women on shows, especially not shows for kids, and considering most female characters I would have wanted to be for Halloween didn’t have brown hair and wigs made me itch. When we catch up with Kimberly, who is rocking some great straight-across bangs the likes of which I sported until high school, she’s at a gymnastics tournament. Her mother and step-father have failed to show up, which is unusual, so she hops on her motorcycle and goes to the little French village where they’re now living, only to find it totally deserted. I don’t want to do a recap of the whole issue–that’s not what this is for. This is just to tell you that I think you should start reading along with me. But already, I’m with her. Something is weird, and she’s throwing on a great leather jacket and going to find out what it is. Reading this issue was like a mystery novel meets a superhero comic. It’s a limited run, so there’s a very clear trajectory and storyline that we’re following. I sometimes feel comics suffer from a haziness of direction for the first few issues, but I didn’t feel that way here. There’s something super weird going on, and Kimberly’s going to get to the bottom of it, and if she dons the Pink Ranger suit along the way, even better. I’d honestly read this comic even if she didn’t turn into the Pink Ranger. She’s compelling: she’s fierce and funny and kickass but not without kindness and soft-heartedness. This isn’t the campy but fun ’90s cartoon. This is a Power Rangers–a Kimberly Hart–for the twenty-first century, and I can’t wait to see more of her. When Basia was part of book club in high school (known charmingly and appropriately as the Bookworms), they decided to start leaving books around for strangers to find: books they thought people should be reading, books they wanted to share with others but lacked a way to do so short of walking up to a stranger and shoving a book into their hands. Each book had a sticker inside with a tracking number, so presumably the individual who picked up the book would follow the link written on the sticker to a library-run tracking service, plug in the tracker, and see where the book had been before. We here at W(REC)’D want to do something like that. If you’ve ever seen the Instagram Books on the Railway, it’ll be something very similar: every now and then, one of us will leave a book somewhere (on a park bench, in a café, on the train) with a W(REC)’D sticker on the cover/inside. There won’t be any tracking numbers, but we’ll be using the hashtag #GOTWRECD to follow these books. We’ll post a photo on our Instagram when we’ve left a book somewhere, as well as a short post here, detailing where we’ve left the book, a quick summary, and even a handy-dandy Google map picture of where the book is (this last is mostly because we like maps). Whomever picks up the book is encouraged to let us know that it’s been found, and, once they’ve read it, are also encouraged to continue the chain by leaving the book somewhere for another reader to find! When you’ve left your book somewhere, write in–either on Instagram or Twitter or in the comments section on our website–and we’ll add a marker to the Google map for where the book has now been left. We’ll be kicking this off in a couple of weeks, book TBD, when Basia is in Dallas for a long weekend. Keep an eye on the page and on our Instagram for what book we’ll be dropping and where you can find it! A Study in Charlotte doesn’t just subvert various Holmes/Watson tropes; it finagles its way around them, over them, through them. There are mysteries, subplots, intrigue, secretive chemistry experiments, a Stradivarius–and, of course, the sort of mutual devotion one expects from a Holmes and a Watson. If you’re worried this won’t live up to your expectations of a teenage Sherlock Holmes: you’ve got the wrong book. This isn’t a book about Sherlock Holmes. It’s a book related to Sherlock Holmes. It’s about legacy and character, history and the modern age, true friendship and loyalty in an age of loneliness and mystery–and it shines. But I will also admit, wholeheartedly, that this book was more than I had hoped, and I am decidedly looking forward to the next installment of the trilogy. The delicate movement of Charlotte and Jamie from strangers to friends and partners is carefully chronicled here. It’s not an easy road–there is, as mentioned, murder and mystery, and also intrigue! forgery! secret tunnels! a literal explosion!–but then, it wouldn’t be Holmes and Watson if it were. I did a write-up for Filigree (as Connor and I have been referring to it when talking about posts) while I was still reading it, but I thought I would circle back around now that I’ve finished and give a more comprehensive review. This was a strange book, and I came out of reading it much the same way that I did the movie Krampus: it definitely wasn’t bad, and I would also say that it was good, but it also exists in a weird tenuous space between the two. My struggle with Filigree is that I kept forgetting to read it. Normally, when I’m reading a book, even if it’s a book I don’t feel compelled to devour, I have the urge to finish, because I hate leaving things undone. I’ll make time to curl up in my favorite armchair with the book on my knees for at least a few minutes, just enough to get in a chapter or two while I have my tea. But I found I wasn’t doing that with Filigree. It is, as I said before, a quiet sort of book, but while that was part of its charm, I feel like it also might have worked against it in some ways. I’d think about reading, would have to think about what I was currently reading, and then I would remember Filigree and that I had yet to finish it. Sometimes I would pick it up, and other times I wouldn’t. I always had to make a conscious effort to remember to read it. Another reason I think the overall tone might have worked against the book was I was finally at the book’s climax, but I felt no urgency. I am sure I was meant to–the events unfolding were crazy and tumultuous–but I couldn’t muster the appropriate feelings. This is not to say that I didn’t care about the characters, because I did. But I also found I cared more about the secondary characters than the three protagonists; in some ways, I felt that they had a bit more substance to them, like I knew their personalities better. I didn’t feel relief when I was finished with the book, because the overall story was an interesting one and I truly did want to know what happened, but I also didn’t experience any of the usual things I feel when I finish a book. It was simply over, and I could finally move on to something else. Filigree was a good book, but a strange one. I am glad I read it, but I can’t see myself ever picking it up for a reread. It is certainly not a book for everyone. But if you’re willing to give it a try, I hope that you, like myself, are at least charmed by the little clockwork octopus that has a penchant for stealing socks and hiding in drawers.